After many successful attempts at stalling, I managed to finish the curtains for Madeline's room. No, they don't touch the ground. Yes, this was on purpose. 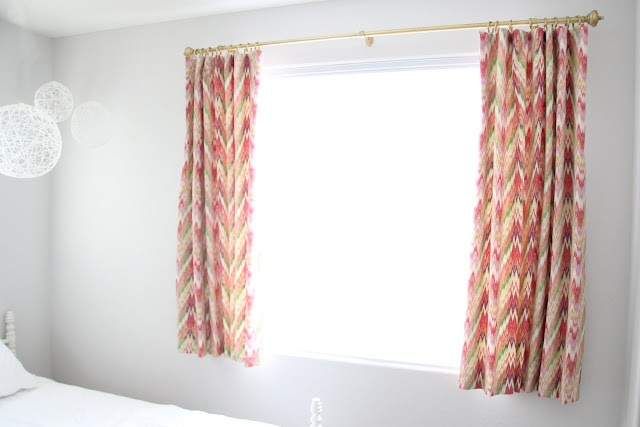 When I made the decision to try short curtains I knew it was a risk but, if it worked, one that would save me a lot of money. Those savings would allow me to spend more accessorizing in other ways. Lucky for me, they turned out and I still have a large portion of my small budget to spend elsewhere in her room. I wrote a little here about Madeline and I disagreeing over the color palette for her room. My pick was coral, turquoise and yellow. Her pick was purple and…purple. Mean li'l mom that I am, I immediately broke her heart by saying no purple. I saw this fabric, though (and because I'm nothing if not kind-hearted, fair and generous…real mom-of-the-year type stuff ), I immediately knew it would work to add a little. The purple running through the drapery fabric is subtle and such a pretty color. (You can see it better in these photos). When I brought the fabric home, I got squeals of delight and a very dramatic, "You're the best mom ever!" I purchased two of these curtain rods for $10 at a local thrift store over 2 years ago and finally get to put one to use! I started by spraying it with Rustoleum's brass spray paint. I'm not a big fan of the oh-so-popular clip rings, but I also didn't want to spend a lot of time on these, so I decided pin hooks were the way to go. Then I used Britt from Gus and Lula's nifty shower curtain ring trick. These plastic shower curtain rings are only a dollar and once they're sprayed, you'd never know they weren't the real thing. I had some leftover rings from the roman shade and attached those to the shower curtain rings so it would pivot and hang correctly. Then I attached the rings to the pin hooks. I placed a pin hook 1/2" from each end and then every 7 1/2" in between. 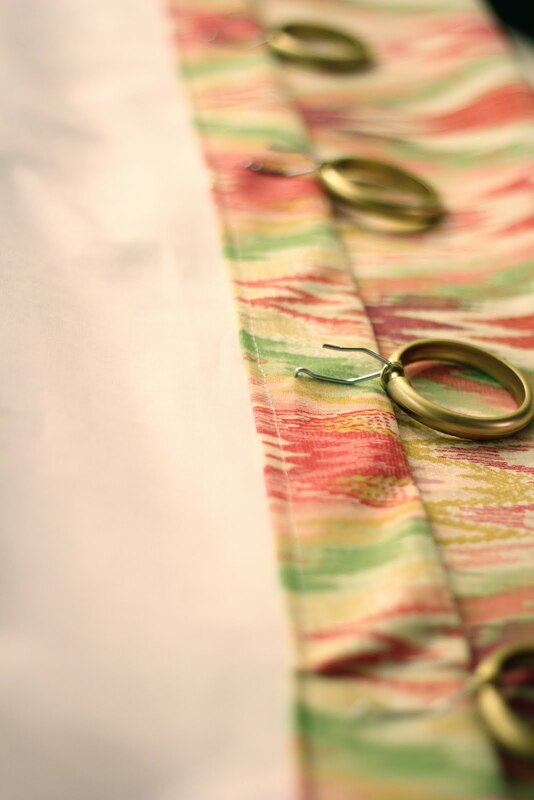 The panel and lining were sewn using the method from the pinch pleated drapes tutorial. This is my styling assistant, Isabelle, who insisted that she wasn't tired and wasn't in need of a nap. I'm in the process of sewing a duvet cover and pillows for her bed. More on that later this week! What do you think? Would you try short curtains in your home? If you're thinking not, maybe you'll change your mind after reading through the cost breakdown. Which makes a total of $50.40! P.S. 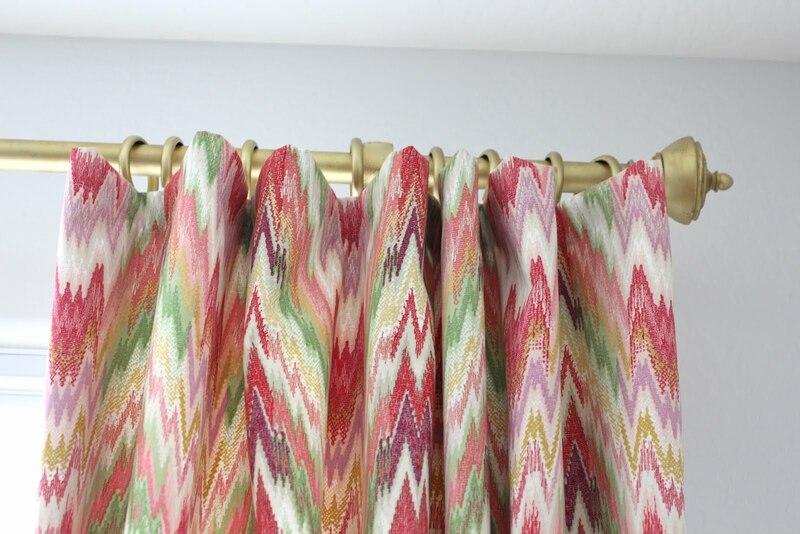 Have you read Emily A. Clark's article on this new curtain trend in the most recent House of Fifty? I'm curious to know why you didn't want her to have purple in her room. I think they look beautiful! I LOVE that print, and I love it with the brass. Very sophisticated. Especially in a place like that, where you really wouldn't see the long ones behind the bed anyway. I love the fabric. Not sold on the short...yet - you always convince me, though! Do you know who makes the fabric? I LOVE short curtains in "kid" spaces- After what seems like harmless hide and seek - and ending in a bent curtain rod- I have shortened my kids' curtains! The fabric you chose is gorgeous! Love the brass accent with it - you have such a great vision! Super cute... love the idea of spray painting shower curtain clips. They look lovely! I can't believe you made them. I am in awe! Thanks for the love, friends! I looove this fabric! Can I ask where you got it? I am hoping Joanne's.....it is the only fabric store near me and I would love to use this in my foyer b/c it is orange and it would look great as pillows! P.S. 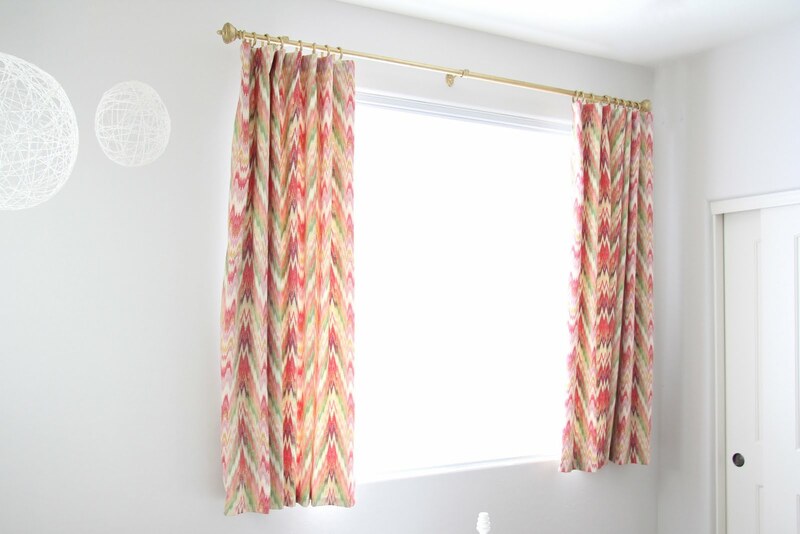 short curtains rule and make a space less formal, which is how a kids room should feel! Love them, they add a great punch of color and pattern against the white walls and being short, they add a playful quality to the room! Thanks for the shout out to HOF as well, posting your project on the HOF Blog tomorrow. More great stuff from you! Erika- 5th Avenue Designs makes the fabric. I was happy to see your short curtains. I am contemplating the same length for our master bedroom. I guess that length is acceptable for a bedroom. I will now get started on making my short curtains. Your curtains look great. I think I am going to have to use short curtains in the living room. It's not my first choice but my dogs are destroying mine. I was wondering whether the spray paint on the rings hasn't scratched off by now, and how many coats you applied. They're holding strong and look great! I applied a primer and two coats of paint. It's awesome to visit this web page and reading the views of all mates regarding this paragraph, while I am also keen of getting knowledge.